Sunday is as Good a Day as any to Save a Few Hundred Thousand Lives | Robert Mitchell Jr. 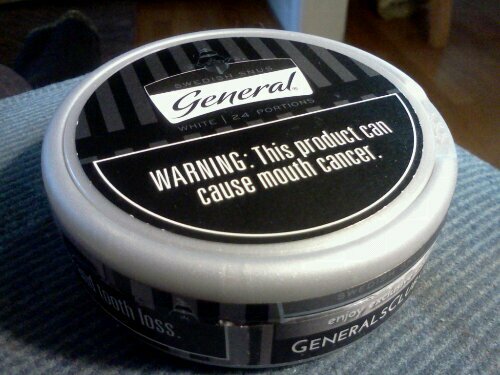 This is can of Swedish Snus by General, a division of Swedish Match (aka Svenska Tändsticks AB). You put it in your mouth so you can get nicotine without inhaling toxic vapors. What day is it? Sunday? Seems like as good a day as any to save a few hundred thousand lives. According to the Centers for Disease Control and Prevention (CDC), smoking causes over 400,000 deaths each year in the United States.¹ The CDC doesn’t have any statistics on smokeless tobacco deaths because the risks are too small to reliably track. Basically, what it comes down to is. If you are smoker, go to your local tobacco shop and get some snus. Put it in your mouth and stop smoking. It may save your life. If every smoker in the U.S. did this it would save hundreds of thousands of lives. Don’t believe me? There’s a nice guy named Brad Rodu who runs a blog called Tobacco Truth, and he has a ton of information on his blog. Brad is a professor of medicine at the University of Louisville. He holds an endowed chair in tobacco harm reduction research, and is a member of the James Graham Brown Cancer Center at U of L. If you ask him questions on his blog, like I did, he’ll answer them. 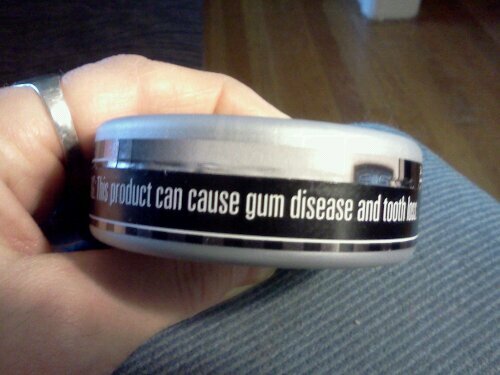 Snus cans have government mandated warning labels that are not supported by facts. How stupid is that? Still don’t believe me? Read this report by the Department of Public Health and General Practice at the Christchurch School of Medicine and Health Sciences in Christchurch, New Zealand. According to the report, snus does not appear to lead to increased risk of cancer, cardiovascular disease, inflammatory bowel disease, or diabetes. But you say, “Mitch, why do snus cans have those scary warning labels?” Answer: Because there’s a law passed by our beloved Congress that says that all tobacco products have to have warning labels. And, as we know, our Congress is full of people who are not swayed by facts. Half of them are scientifically illiterate. There are quite a few who don’t even believe in evolution. It comes down to this. If you aren’t addicted to nicotine, don’t start. Clearly it’s better to avoid putting tobacco into your body altogether if you can. But if you’re an addict and you can’t quit, choose smokeless products. The risks are clearly less. ¹ According to this CDC Fact Sheet. They have smokeless tobacco fact sheet, but it’s uncontaminated by any hard statistics. ² Courtesy of this Wikipedia article. This entry was posted in Green, Martial arts, Writing and tagged smoking, snus, tobacco. Bookmark the permalink. Nice post! I take it you dip yourself? I find when introducing it to friends they cant cope with the strength of the taste after a few minutes, which combined with the fact that it is illegal here in the UK makes it a no go. At least the product is legal in the US. I have to get the stuff brought by friends coming back from Sweden then store in the freezer. Thanks. Yes, I used snus to quit smoking a couple of years ago. For the life of me I can’t imagine why the EU allows smoking but not snus. It’s mental! Excellent article. It’s great to see others who quit smoking by switching to snus. The health advantages speak for themselves. Congratulations! Thanks Chad– all the best. Funny thing, I almost mentioned your site in my article. Snubie.com was one of the sites I visited when doing research before I switched. Like a lot of folks, I initially bought all the disinfo about oral tobacco. But thanks to sites like yours and the one above, I figured out what was up. Salud! Excellent article. It’s so great to see others who realize the health advantages of switching to snus and leaving the cigarettes behind. Hopefully this article will help others reach the same conclusion that so many others have come to: that snus can save lives!